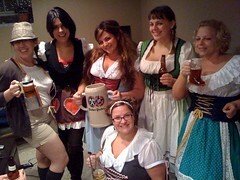 This year we celebrated my birthday with our 2nd Annual Oktoberfest Birthday Blitz. Folks gathered at our house for sausages, snuff, kraut, beer, pretzels, oom-pah music, and cabbage. After that warm-up, we headed to Gasthof zur Gemütlichkeits for the polka band and lots of revelry. Costumes made the whole night way more hilarious. - A cocktail waitress at Gastofs gave me her number; I didn't ask for it. View more photos from the night here.